Create an elegant look for your martin colony using the Heartwood Victorian Martin Mansion. 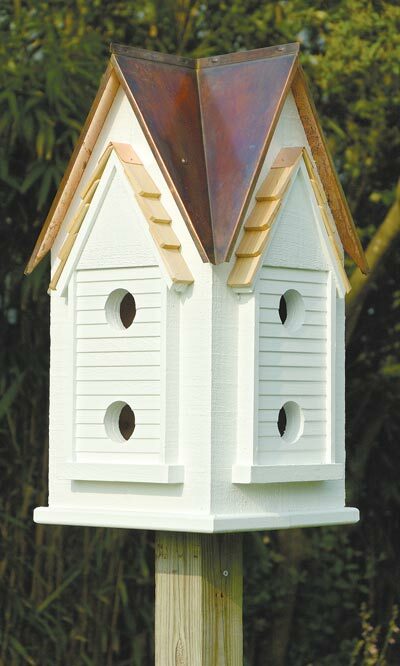 The detailed craftsmanship and strong lines of this home will certainly entice martins to roost in your yard. Each of the four facades on this home has an extended, beadboard-enhanced front panel with two 2.25" diameter openings. An eyebrow gable above the openings has cypress shingles, for added adornment and style. The deep brown roof, with its valleys and peaks, furthers the architectural feel, and its copper construction contrasts the vivid white paint on the home. Each triangular compartment measures 9.5" wide in the front, 4.75" deep, and 6.5" tall, to easily house a new martin family. The roof may be removed from the item for seasonal cleanings and nest checks, and its antique finish adds a classic look to the piece. Use the included 6" x 6" metal mounting plate and screws to easily attach this house to a sturdy post. Bring martins a timeless roost with this Victorian Martin Mansion. Made in the USA.